A grizzly bear rubs against a tree in Clayton Lamb‘s British Columbia study area. Clayton uses hair samples from grizzly rub trees to identify individual bears and further our understanding of BC’s grizzlies. Bear claws are one way to identify the bear species. Black bear claws are short and have a darker color. Grizzly claws are long (about as long as human fingers!) 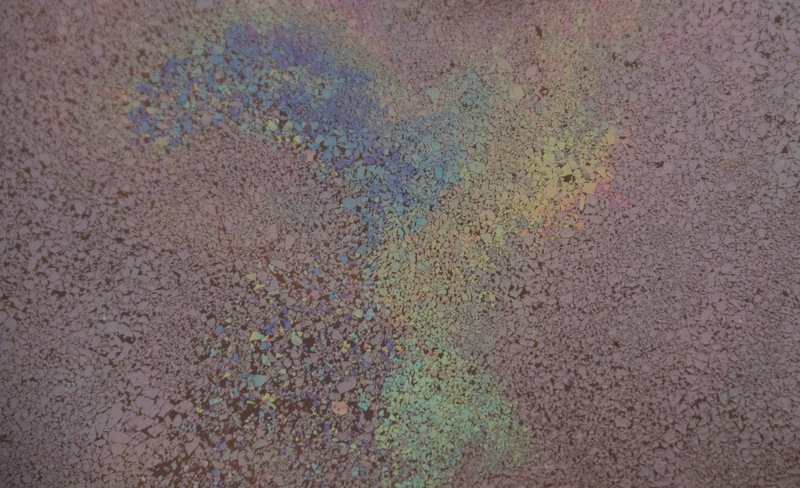 and light-colored. The incredible stillness of walking through a forest in the winter. That wonderful feeling of floating on top of the snow when there’s a solid crust. Hoarfrost coating everything on a chilly morning. Eerie winter sunlight straining through the clouds. Seeing exactly where an animal walked: coyote tracks in the snow. When the local residents follow you around, gray jays will often do this. Photos and text by Julia Shonfield. 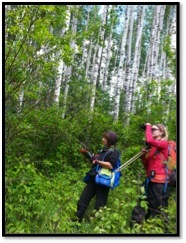 In an earlier blog post, Anjolene Hunt detailed the daily routine of her and her field assistants tracking the movements of Canada warblers. 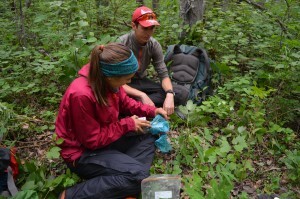 I thought I’d do the same for the small mammal trapping I conducted with my crew this summer. 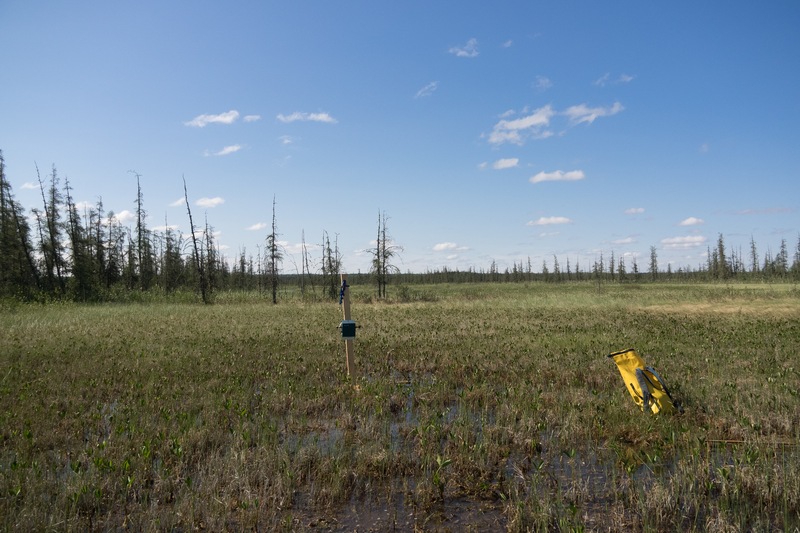 As part of my research on the effects of industrial noise on owls in the boreal forest of northeastern Alberta, I’m also interested in finding out if those same sources of industrial noise have an impact on the abundance of small mammals, the main food source of owls. This year we set out 64 live traps at each of 23 different sites (each just over a hectare in size) and trapped each site for four days in a row. 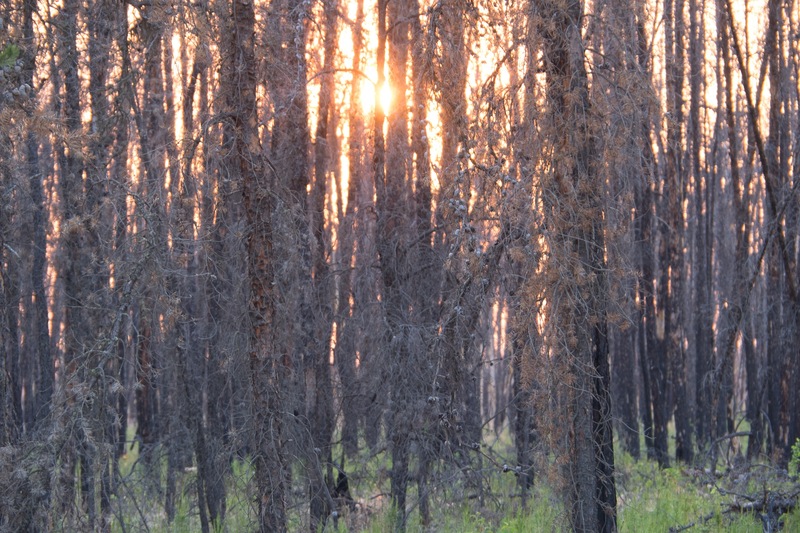 5:30 am – We’re up out of our tents, dressed for the field and eating breakfast. In July it was already light out at this time, but by the last couple weeks at the end of August we needed our headlamps to get ready. View of one of our campsites from across a small lake. Photo by Julia Shonfield. 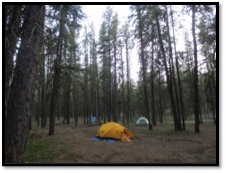 6 am – We leave our camp and drive to our sites. On our way in to one our sites. Photo by Julia Shonfield. 6:30 am – We arrive at the first of three sites and start checking the traps. At each trap, we check if the door is open and if it is we lock it open so that no animals get caught in there during the day. 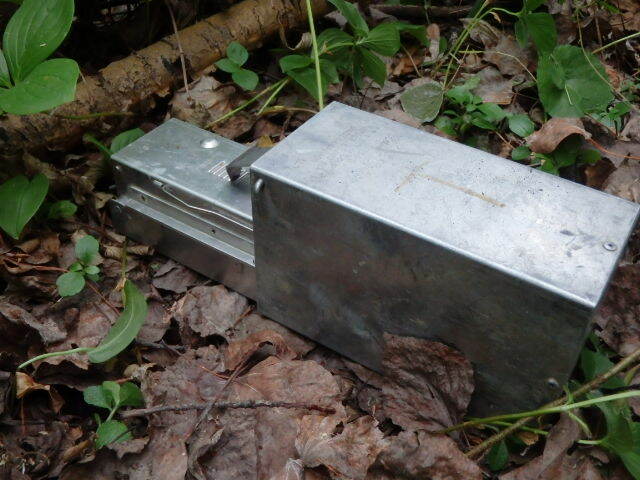 If the door is closed, we find a comfy spot on the forest floor and take out our trapping kit. We open up the trap into a mesh bag. Once we get the animal in there we can take a closer look to see what species it is. 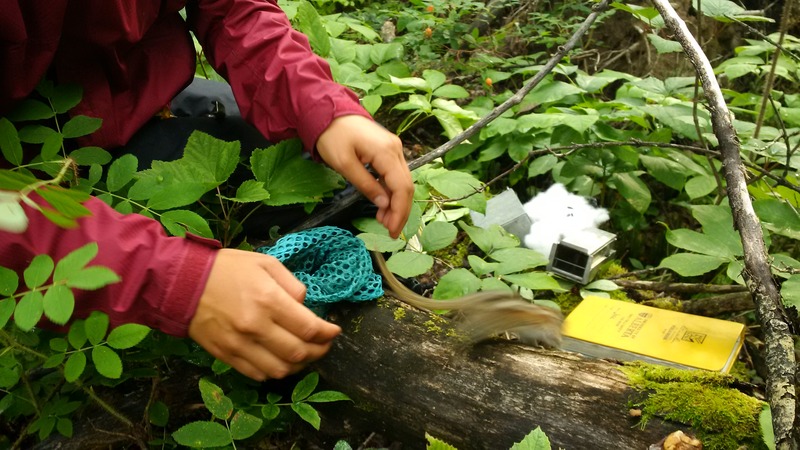 Deer mice and red-backed voles were our most commonly captured species, but we also caught a few meadow voles, a chipmunk, a weasel, and a flying squirrel. Every animal caught gets weighed with a spring scale, checked if they’re male or female, and ear tagged with a small metal ear tag, each with a unique number. After all that, we open up the bag and let them go, and watch them disappear into the underbrush. There’s a good chance we’ll catch that same guy in the next couple days, sometimes in the same trap or in one of the other ones nearby. 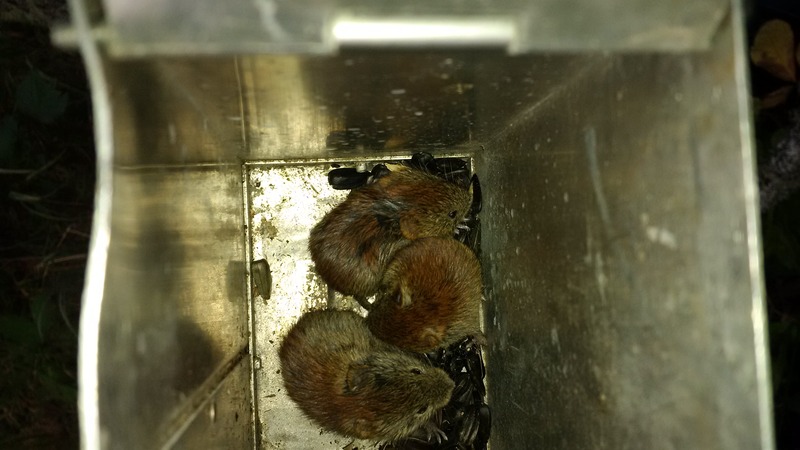 Usually we only get animal per trap, but in this case there were 3 very young red-back voles, likely siblings born this summer. Photo by Julia Shonfield. 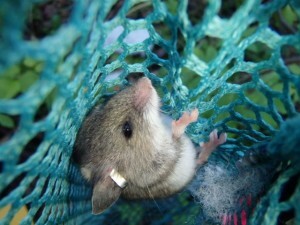 The first step is to get the animal out of the trap and into the mesh bag. Photo by Julia Shonfield. This deer mouse is a recapture, he’s already got a shiny metal ear tag. Photo by Julia Shonfield. A chipmunk flies out of the bag in a blur when released. Photo by Julia Shonfield. 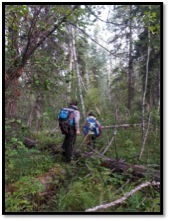 11 am – By this time we’ve usually finished checking all the traps we set out and head back to camp for lunch. 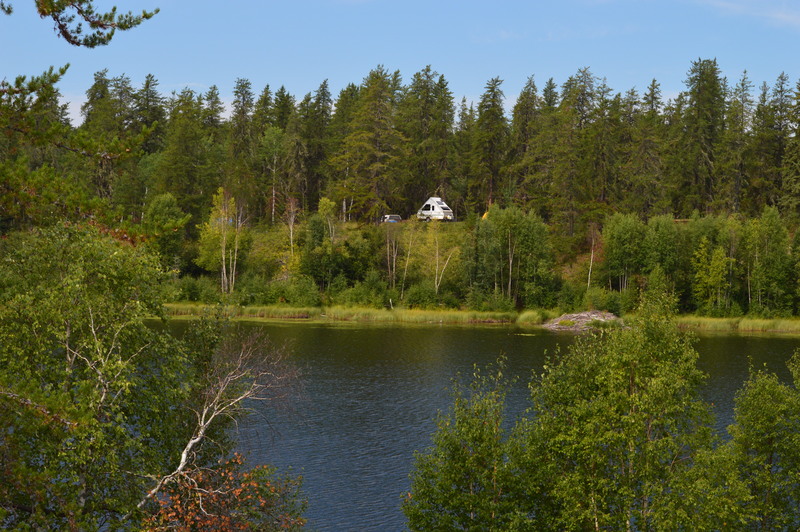 12 to 3 pm – We use this time in the middle of the day to catch up on data entry, but also to catch up on sleep, go swimming in a local lake, pick berries or some other relaxing activity. 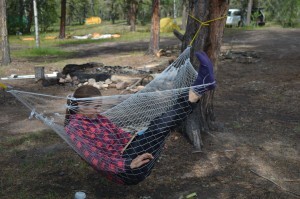 An afternoon spent relaxing in a hammock at one of our campsites. Photo by Julia Shonfield. 3:30 pm – Dinner time! 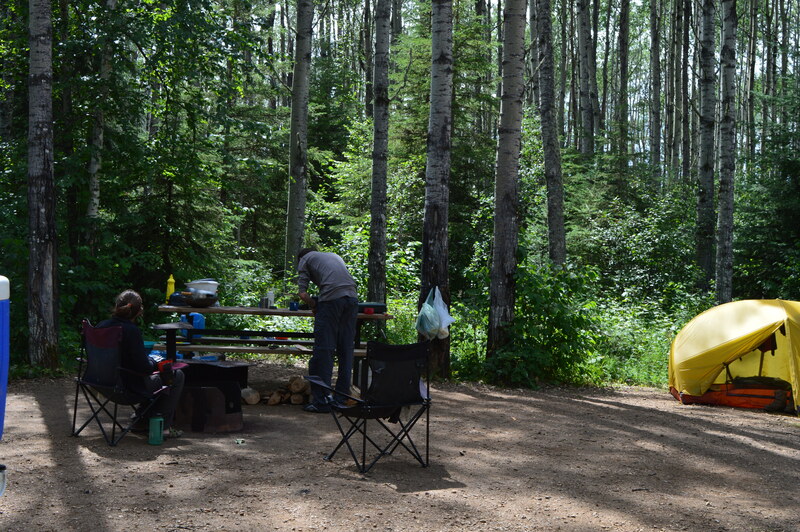 The four of us would each take a turn cooking dinner, and we had some excellent camp food over the summer. 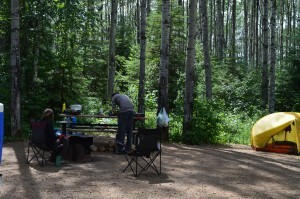 Cooking dinner in the great outdoors. Photo by Julia Shonfield. 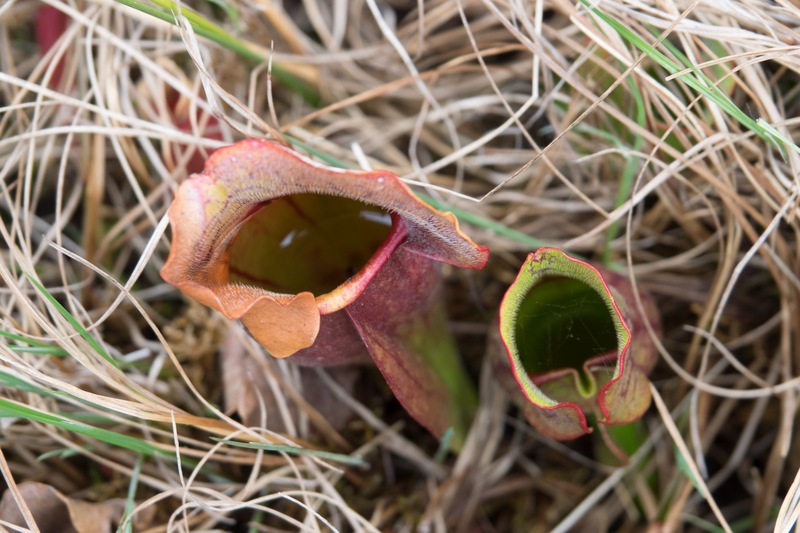 4 pm – We head out again to our sites to set the traps. 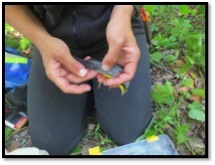 Each trap gets baited with a handful of sunflower seeds and a small piece of apple. We also stuff each trap with bedding so the animals can make a nest in there overnight. 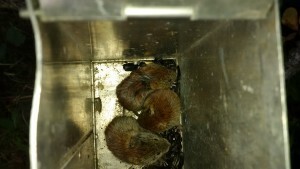 Lastly, we unlock the door and put a smear of peanut butter at the entrance of the trap to entice the animals inside. 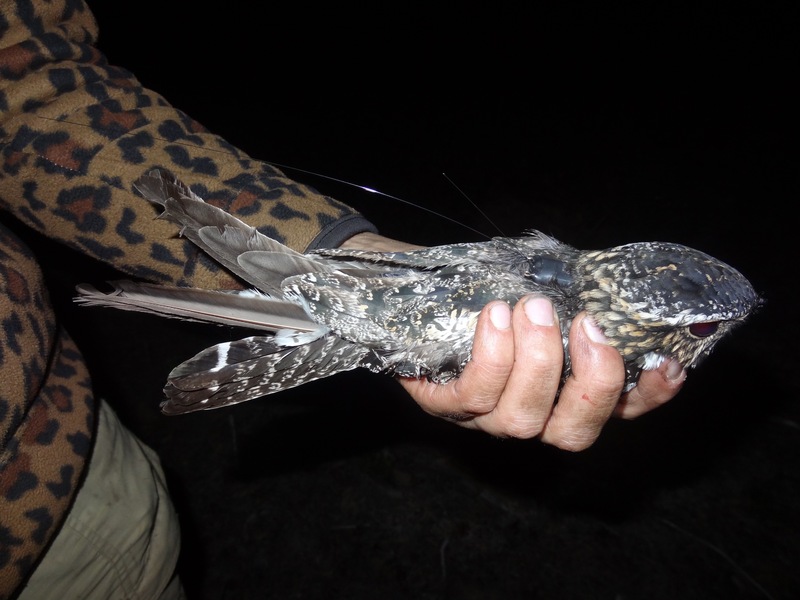 A baited Longworth trap. Photo by Julia Shonfield. 8 pm – By this time we were typically back at camp for the evening, enjoying hot chocolate around a campfire, playing cards or reading before heading to our tents for the night. 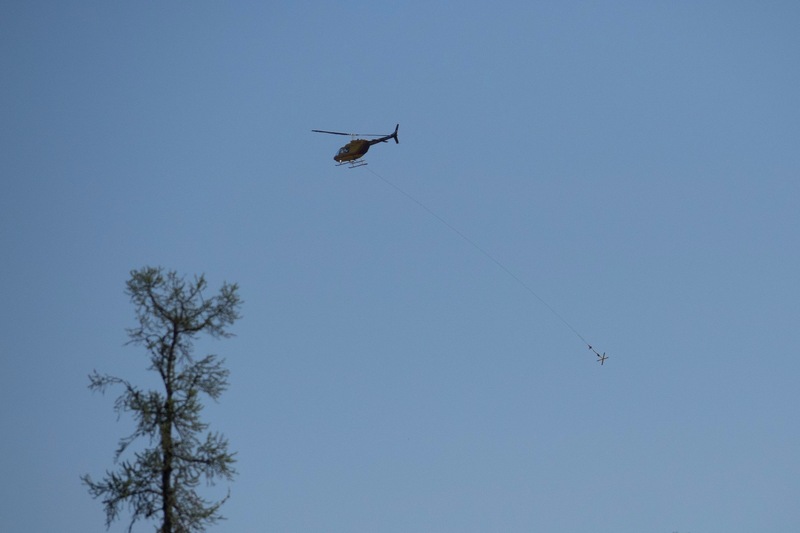 Between June and August of 2015, field crews led by Clayton Lamb conducted a grizzly bear population inventory in the threatened Kettle-Granby Grizzly Bear Population Unit. 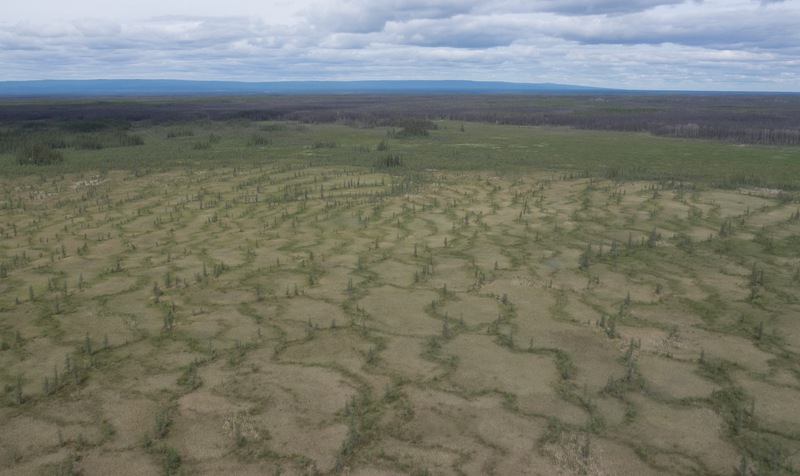 Crews set 124 bait sites across the ~8,000 km­2 area, which consists of rotten cow blood enclosed by barbed wire to non-invasively collect grizzly bear hair, which is then used to identify individuals through multi-locus genotyping. The bait sites were checked for hair samples at two week intervals, with most sites being checked four times throughout the summer. 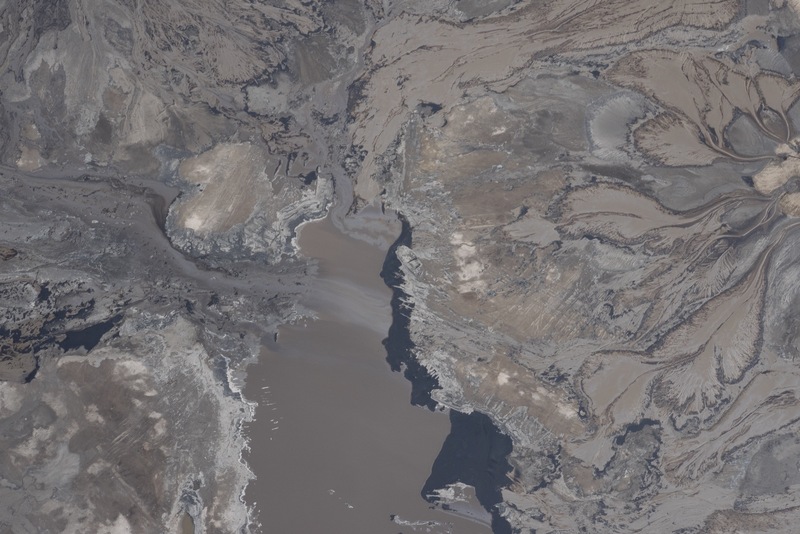 A total of 1360 hair samples were collected, and field staff visually identified 29 percent of the samples as grizzly hair. The hair samples are currently at the genetics lab (Wildlife Genetics International) in Nelson, and we expect to have the genetic results back before March 2016. 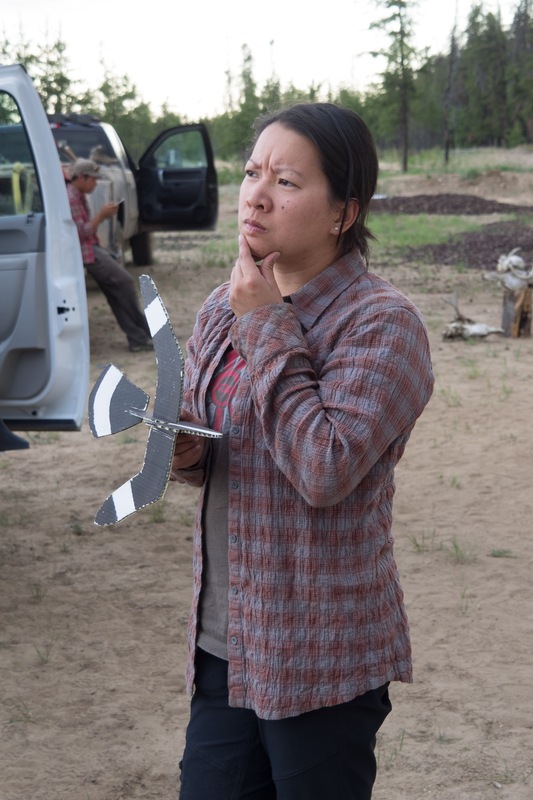 During fiscal year 2016-17, the genetic data will be used to generate population estimates and address questions regarding population size, composition, connectivity and the distribution of grizzly bears within the study area. 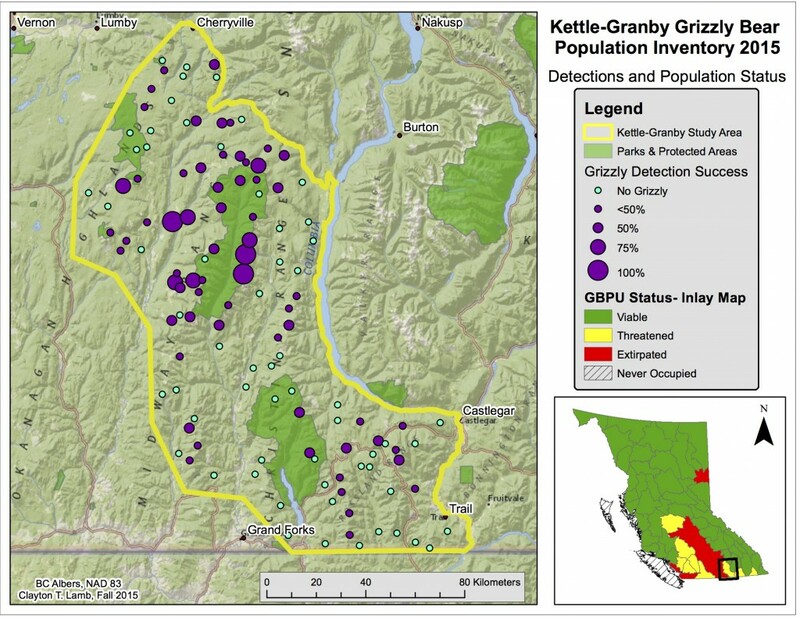 The study area for the 2015 Kettle-Granby Grizzly Bear Population Inventory, with the locations of the 124 baited hair snag sites identified by coloured circles. 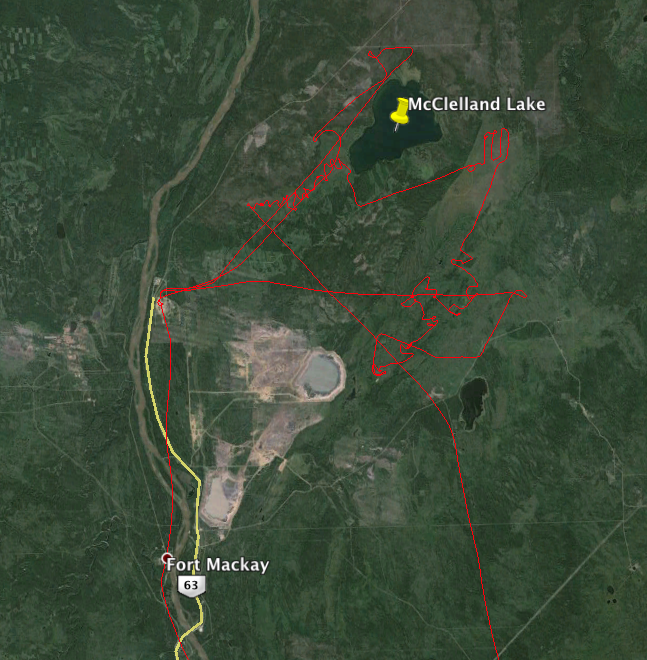 No grizzly bears were detected at the turquoise circles, while grizzly bears were detected during at least one check at the purple circles. 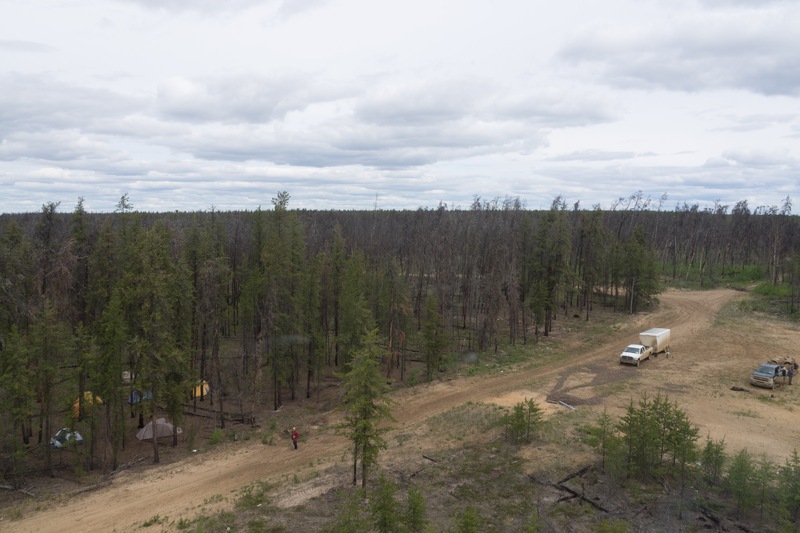 While grizzly bears were detected throughout the study area, they were more commonly detected in the area in and around Granby Provincial Park. 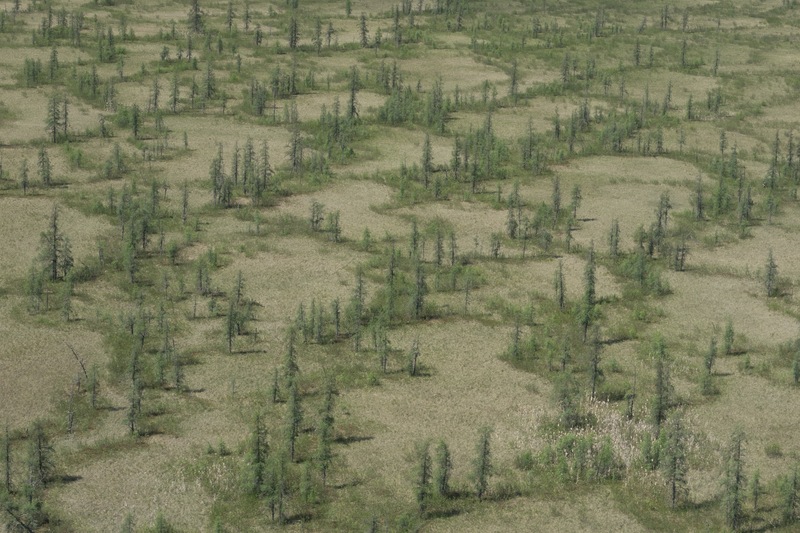 Note: Hair samples were classified as grizzly samples in the field based solely on visual indicators. When people ask what I do for a living and I say “I follow birds around the forest”, I often get strange looks. In reality, that is only a small part of what I do. Research in Ecology and Conservation often involves fieldwork (the running around the forest part) and/or lab work, data analysis, and writing of results. 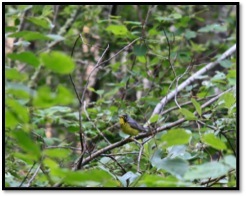 In my case, my main research goal is to investigate how a threatened forest songbird species (the Canada Warbler) selects habitat in areas affected by forestry activity. 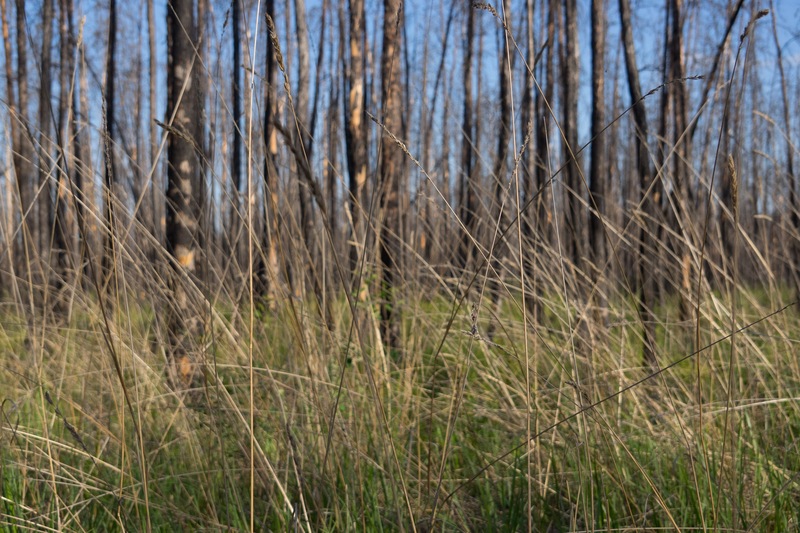 I hope to provide information on what habitat features need to be protected, and recommend best management practices to forestry companies to aid in the recovery of this species at risk. 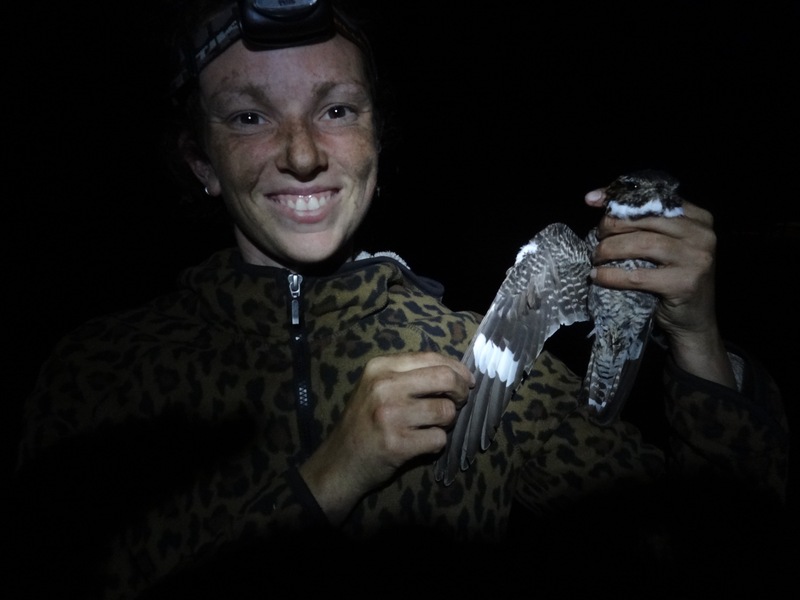 3 AM: We are up with the birds and taking our breakfast by the light of a headlamp. 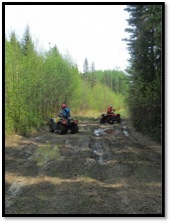 4 AM: We quad, hike and bushwhack through dusty, muddy, log-strewn trails, cutlines, and thick forest to reach our study sites. 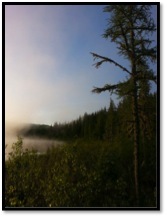 5 AM: We enjoy misty sunrises by the lake while trying to pick out the melodious song of the Canada Warbler among tens of other songbird species. 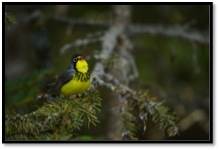 7 AM: We use recordings of territorial male Canada Warbler songs to lure other males into a net. We gather information such as the bird’s age, weight, and wing length. 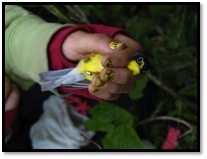 To distinguish between individual males, we attach specific combinations of tiny colour-bands to their legs. 10 AM: Armed only with our binoculars and GPS units, we follow each marked bird throughout the summer, taking GPS locations, and observing them find food, find mates, and raise their young. 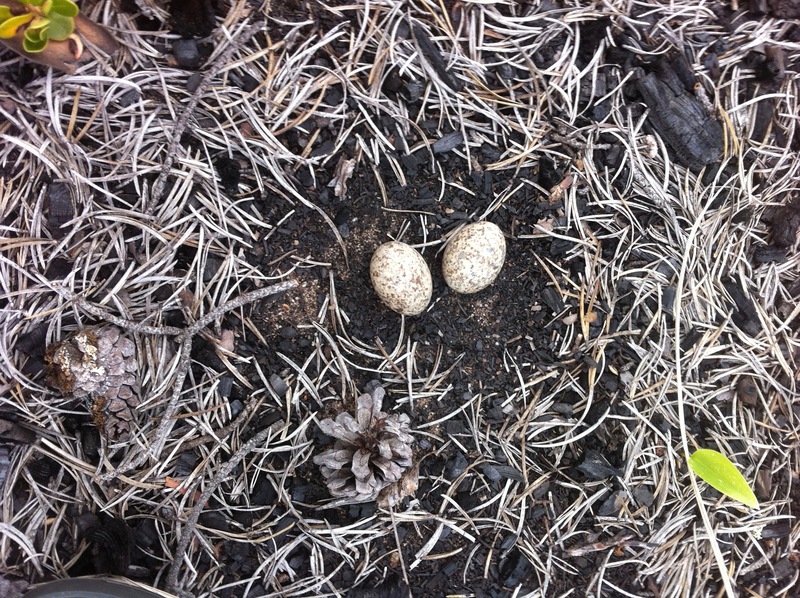 These tracking bouts, combined with habitat surveys, help us to determine home range sizes and gain insights into the habitat types they use. 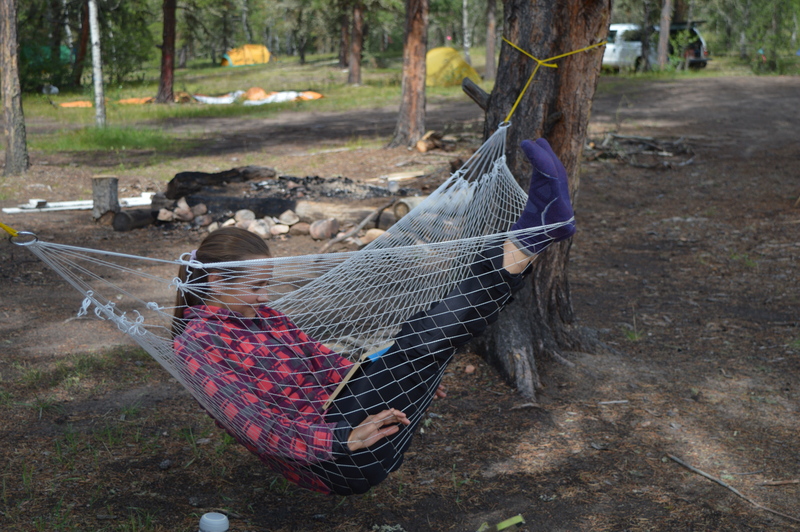 Evening: We enjoy the simple comforts of camp-cooked meals, guitar music, and naps in the great outdoors! 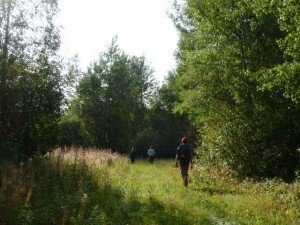 All in all, wildlife ecology fieldwork makes for an unconventional, but unbeatable career! Stay tuned for the results of this study….